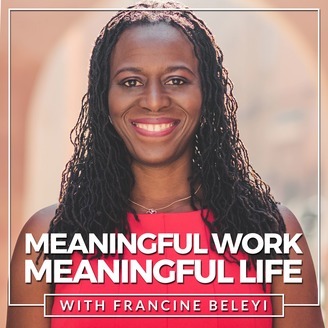 Meaningful Work, Meaningful Life (#MWML), is the show that empower you to redefine the life you want and live your best life now! Hosted by Francine Beleyi, founder of nucleus of change. Join me and my guests weekly for an inspiring and thought-provoking show. 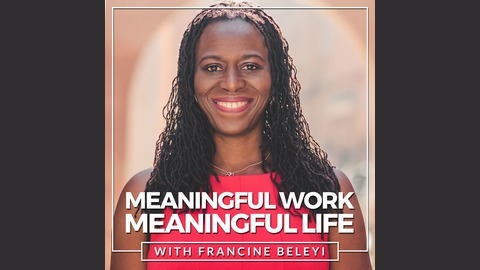 Welcome to Season 2 of Meaningful Work, Meaningful Life podcast. When I started this podcast 15 episodes ago, my focus was to find out and share with you how successful CEOs, entrepreneurs, thought-leaders have found their way doing Meaning Working and living a Meaningful Life. Meaning, how they’ve managed to do work that matter Money, how to get paid well doing what we love Movement, how they are impacting others. In the book, I’ve shared a lot of insights gained from my search for a solution and the insightful discussions with a wide range of people across all walks of life, with different levels and forms of success. The book is available as eBook, paperback and audiobook on Amazon, iTunes, Audible and other online book stores; go and check it out. In this Season 2, I’d like to deep dive on the second M money – why? This is a topic that I’ve struggled with myself and my clients have also struggled with that led me to study marketing in depth. But this is also part of a bigger vision to see a world without poverty! Last year, I had the opportunity to co-create a community of women entrepreneurs across Africa. When I looked at the issues that hundreds of them face, money issue is at the top of the chart in various ways. So, I’d like to dig a bit deeper around this issue and propose some of the ways we can be smarter when it comes to getting paid what we want & live the life we want. Money is one of these topics that get people excited: positively and negatively… That is the point! There are taboos, limiting beliefs, fears, myths around money especially with people who have a big heart and want to help others but are struggling themselves. If you are one of those you understand what I mean, right? Perhaps you are a professional or executive in a corporate who are still struggling to negotiate a higher salary or get a promotion…If that’s you, it’s time to call this off, get educated and make better decisions. In today’s episode I explore the three key reasons why you are not getting paid what you want. Listen to the episode to find out what they are and what you can do about them. What is one of the toughest money issues you are struggling with right now that is preventing you to live a meaningful life? Leave me a message under this post at www.francinebeleyi.com/podcast. The show notes of this episode of MWML are available on my webpage www.francinebeleyi.com/podcast with all the references and resources shared on the show.